Forget about Annabeth! She’s gone! I’ve found that I’ve got an affinity for the whole mostly-stream-of-consciousness post with book quotes made as I read, so it’s looking like that may become the primary modus operandi around here, especially as I didn’t get any complaints last time. (So if you don’t like it, speak up now and make your voice heard!) Plus, it might help me get these read/posted faster! So Annabeth is gone, but not dead-gone. Just gone-gone. Vanished, and there’s no point in looking for her. I’m not too worried about her at the moment. I figure she’ll turn up sooner or later. This isn’t Game of Thrones, after all. …Right? 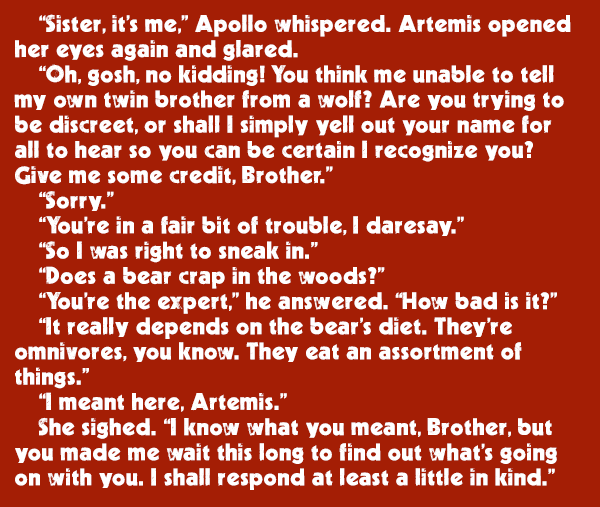 I’m liking Artemis thus far, too. She seems to be a kind, understanding sort. I approve. Okay, so she also killed those folks in the helicopter, but they WERE trying to kill Percy et al., so I can’t really fault her there. She’s got a tiny bit of a sense of humor, and doesn’t seem to be an active jerk like Dionysus or Ares. (Of course, no one’s an active jerk like Ares…) I like how Riordan’s chosen to portray her. Seven years ago, Thalia had been turned into a pine tree by her father, to prevent her from dying. She’d stood her ground against an army of monsters on top of Half-Blood Hill in order to give her friends Luke and Annabeth time to escape. She’d only been back as a human for a few months now, and once in a while she would stand so motionless you’d think she was still a tree. Coming so soon after Annabeth’s disappearance, this made me wonder if the same thing just happened to her. Did Athena do something? 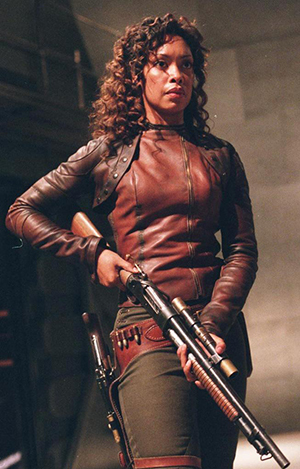 Incidentally, I want to know why Thalia hates Zoë and the others. Aside from being a bit stiff, they seem alright to me. While I could see that stiffness being in conflict with Thalia’s rebellious personality, I figure there’s likely more to it than that. I recognized Zeus with a lightning bolt, Ares with a spear, Apollo with his sun chariot. Did I mention I’m liking Nico? We need to have this kid around as much as possible. But hey, Percy’s never written with Riptide? As a writer: BAD Percy! NO biscuit!! Give ME a magic pen, somebody! I’ll put it to use! “Can goddesses pray?” I asked, because I’d never really thought about that. Percy, that is not the question you should be asking, here. If I may borrow from Winston Zeddimore of the Ghostbusters, when someone implies they know what the big scary mystery-monster is, you say, “WHAT IS IT?”!! On a related topic, let me just take the time to say that something about Riordan’s equating swearing off men with remaining a 14 year-old girl forever strikes me as…uncomfortable. I can’t put my finger on it. Immortality in exchange for revering Artemis and being one of the group I can understand, but not being allowed to ever be an adult in the bargain? What’s being implied here? If you’re an adult woman, it means you have to be with a man? AHA! 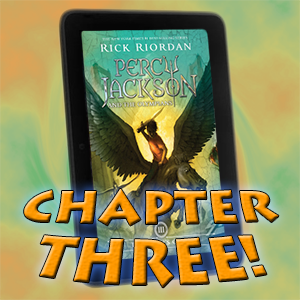 I’m now on pins and needles, hoping I’ll like Riordan’s take on Apollo, yet bracing against the reverse. Mixed in there somewhere is the fear that our independent takes will be exactly the same (will Apollo be severely overworked, for example?) and I’ll appear unintentionally derivative. Why is Percy so disappointed that Bianca is going with Artemis? He seems to be taking it personally. He’s just met the girl. How does it harm him if she goes to join some other compatible group? It’s not like she’s headed off to join up with Luke’s gang, after all. Let people make their own life choices, Percy! Plus Nico’s more fun anyway. His constant geek-references (at least to his game) remind me a bit of Leif, a genre-savvy mortal from Zeus Is Dead. Though Leif is a lot more cynical. And almost two decades older. But that’s a topic for another time. I believe Percy wants Bianca to come to camp so badly because 1) he’s got it ingrained into his head that training there is the best option for demigods, and 2) he wants there to be more people fighting for the camp because it’s important to him. I confess that angle hadn’t occurred to me (though when Percy expresses the same sentiment in Chapter 4–which I hope to have posted soon–I understood where he was coming from). Wohoo~! Couldn’t wait for a new chapter! Anyway, as for the Hunters – I don’t think that’s the case. Artemis accepts any woman, doesn’t matter the age or species. It’s just so happens that most of them here, in the story, are shown to be in their early (eternal) teens.